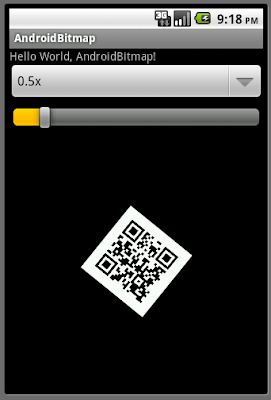 Here Rotating function is going to be added on the last exercise "Scale bitmap image, using Matrix". It's a SeekBar on the screen to change the degree to rotate the bitmap, by using of Matrix.postRotate(). But can you help me on how to crop an image. This Work only when we have Width And Height of ImageView fill_parent. If we change them its rotation does not remain fine.